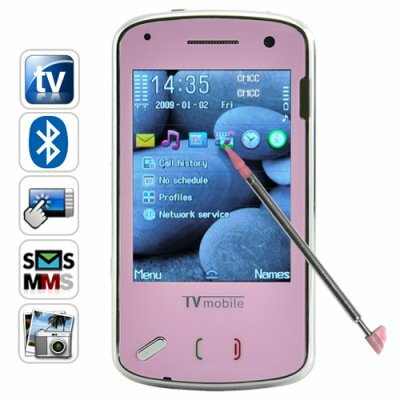 Successfully Added Allure - Mini China Cell Phone (Quadband, Dual SIM, Touchscreen) to your Shopping Cart. The Allure, an easy to carry Mini China Cell Phone that is fun, fashionable, and useful. Everything you ever wanted from a mobile phone for only a fraction of the price and size you would expect, but with twice the style! This highly desirable Mini China Cell Phone comes with a highly response 2.5 inch flat touchscreen and easy-to-navigate touch icon interface. The inside of The Allure is just as impressive as the outside and includes the same superb functionality you would expect from brand name phones. Features such as full native quad-band functionality (850MHz, 900MHz, 1800MHz, 1900MHz), two SIM card slots for business and personal communications, full bluetooth support for ease of use on the town or in the car, and is fully unlocked so you can use it on the network of your choice. Dual SIM and Dual Standby: Not only can you have two active phone numbers inside one cell phone, but you can also be assured of never having to miss a business or personal call on either of them. Dual Camera: Front and rear lenses for a more versatile shot - self portraits and self recording made easy. Analog TV, Video/Music Player: Powerful analog antenna picks up your favorite TV channels for free! You can also transfer your video files for viewing in fullscreen on the Allure's 2.5 inch screen. SMS text messaging, MMS media messaging, MSN Messenger: Stay connected! Use the virtual QWERTY keypad, or even handwriting input, to easily send multimedia or text messages. Bluetooth: Connect to your favorite bluetooth accessories, like your handsfree earset or car speaker kit. And much more - be sure to check the technical specifications at the bottom! Designed to be the easiest phone you will ever use, the Allure was made for today's busy lifestyle and will cater to your every need, whether you are a corporate executive or soccer mom. The Allure is expected to be one of our top sellers and makes for a great resale item due to the combination of high quality and low price, so be sure to get yours before the fad starts! In stock now for single piece or large bulk purchases, order it now and we will express ship it out the very next day! Best budget cell phone on the market! Does the CVLE-M102 come with an analog TV tuner? Yes, watch TV and be happy with The Allure mini phone. When a calls come in, go to the options. One of the items on the menu will allow you bring up the sound recorder to tape the entire conversation as a sound file for playblack at anytime. What is Dual Standby and does the Allure have it? A phone which is designed to work with 2 Subscriber Identity Modules (SIMs) are called Dual SIM phones. Of these Dual SIM phones, the ones which allow both SIMs to be active at the same time so you can receive calls on both are called Dual Standby phones. Yes, the CVLE-M102 is a dual SIM, dual standby phone. It's really easy. Simply press the CONTACTS icon on the bottom of your screen and select "caller ringtone". After choosing the ringtone, you'll be prompted to associate it with a particular contact in your phonebook.